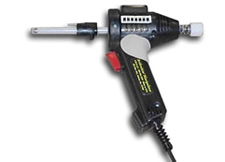 This hand held device delivers consistent, carefully controlled impulses at the optimum angle for maximum correction. We begin with a thorough analysis. We check the structural system of your body. Areas that can be out of proper alignment may include the skull, your feet and everything in between. By using an approach similar to applied kinesiology, in which muscles become weak when challenged or confronted with a negative impulse, we ascertain the exact location of lost structural integrity. Those new to chiropractic are often surprised by the accuracy of this diagnostic system. With a clearer picture of the source of your problem, we enter the correction phase. We use an FDA approved instrument called the ArthroStim. Not only does this device deliver a fast, accurate and low force adjustment, adding energy to misaligned structural components of your spine, it does so by tapping 12 times every second. This controlled tapping avoids having to twist, turn or “crack” the joints. The other advantage is we’re able to adjust you while you assume positions that tend to make your problem worse, such as standing and sitting or even chewing (TMJ) or typing. This versatility allows your body to more quickly process the energy of the adjustment and begin making corrections. Many people report a feeling of ease as nerve stress is released. Those with chronic, long-standing injuries find that healing occurs in stages, as if the layers of an onion are being removed. Repeated visits are usually necessary to strengthen and retrain the spine.